1. Cut the aubergine into cubes, the onions into rings and the pepper into pieces. 2. Put the red beans into a sieve, rinse in cold running water and leave to drain. 1. Sweat the onion rings and the shredded garlic in heated olive oil until glazed. 2. Add the quorn mince and the herb mix and fry for about 5mins while stirring. 3. Add the aubergine and the paprika and stew until cooked on a low heat. 4. Pour over the white wine, bring to the boil and add the peeled tomato with the liquid. 5. Leave to simmer for about 20mins on a low heat. 6. After 10mins add the red kidney beans, stir well leave to simmer. 7. Meanwhile cook the rice in vegetable stock, drain in a sieve or colander and leave to drain well. 8. 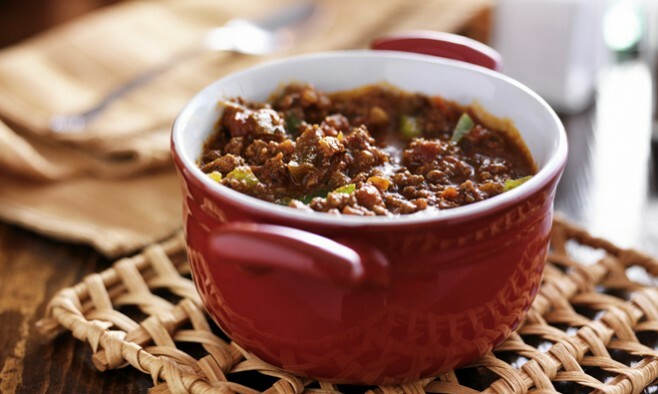 Season the chilli sin carne with finely ground pepper, salt and some drops of lemon juice. Just before serving, add the finely chopped parsley and chives. In a deep plate shape a nest of the spirelli and pour the chilli sin carne into it. Level 6: cook the vegetables really well and mash or cut the spirelli separately. Level 5: finely mash, or grind the Chili sin carne and the spirelli separately, add stock if required. Level 4 and 3: Finely mix and sieve the Chili sin carne and the spirelli separately. Add stock until the required consistency.